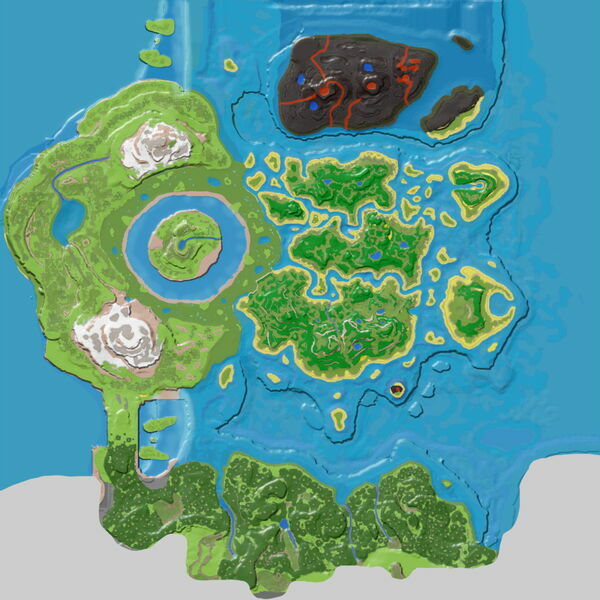 Notice: Until The Center has official region names, this page represents the Snowy Grasslands to the Far West of the Floating Island, including the plains, area around the Green Obelisk, and the iceberg where Kairuku are found. The Snowy Grasslands (unofficial name) are sprawled out around the Green Obelisk and is a difficult area to survive in with its dangerous predators and cold temperatures. In the middle of the grasslands rests a large lake, known as Penguin Pond with an iceberg floating in its center. This iceberg is the primary habitat of the Kairuku in The Center, and thus the only place to reliably obtain Organic Polymer. Also found on the iceberg are several Oil-bearing rocks and Metal nodes. Large amounts of metal can be found along its several cliffs and especially along the Edge of the World. Extreme caution should be taken near the Edge of the World, as falling in would result in losing everything on a survivor as well as any mounts. After Patch 247.0 you won't lose mounts, but you still have the chance of losing all your stuff. As falling into the water can cause your body to sink or float away. Still take caution. This page was last edited on 18 January 2019, at 18:51.